Southwark's rogue landlords - enforcement or endorsement? We have written briefly before about the Aylesbury estate leaseholders subjected to CPO proceedings and how the council’s low valuations of their homes shares similarities with the story of the Heygate’s leaseholders. Former Aylesbury leaseholder Mr Olufemi Joshua, went to the Upper Lands Tribunal last week. He was taking Southwark Council to court over the low compensation paid for the loss of his 1-bed flat and he heard some extraordinary admissions from a senior council official. Mr Joshua’s barrister first revealed that the flat Southwark had used to estimate Mr Joshua’s compensation - by way of comparison - had been illegally converted from a 1-bed into a 4-bed flat. Southwark’s officer responded that this quite often happened and that rogue landlords could reasonably expect not to be discovered. He explained that he had used the illegally-converted flat’s rental income as the basis for calculating Mr Joshua’s compensation. Mr Joshua’s 1-bed (but legal) property could not raise as much rent as the 4-bed (illegal) property, so therefore Mr J was entitled to less compensation. The council officer had used the illegally-converted flat unwittingly in assessing Mr J’s compensation, but nonetheless defended the valuation. He also referred to another illegally-converted 1-bed property (98 Taplow) and his opinion was that investor landlords commonly take such risks. Mr Olufemi Joshua, formerly of 252 Bradenham on the Aylesbury - and now displaced to Grays - had first been offered £65k, which was later raised to £85k before the Tribunal. Mr Joshua’s surveyor had valued his home significantly higher at £146k. The illegally-converted flat (no. 109 Wendover) used for the comparison had been sold at a Savills auction in March 2013. This was around the date that Mr J left his home and so was used as a suitable ‘comparable’ despite having 4 bedrooms. The auction particulars describe the property as a 4 bed flat currently rented out at £300 per week. 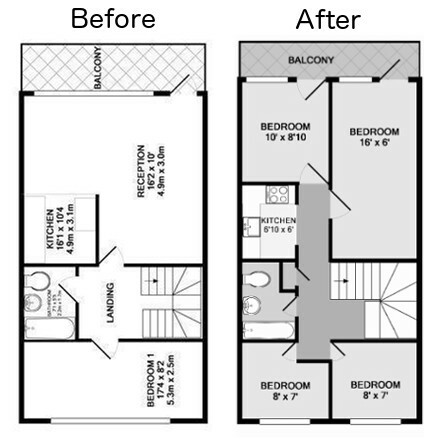 Mr Joshua’s surveyor presented the floor plan of the illegal flat to the Tribunal, and explained that whilst internal layouts differed, the properties were identical in overall size. He showed how rudimentary plasterboard had been used to divide the rooms, two of which were not much longer than a single mattress. Mr Joshua’s surveyor went on to claim that the council’s valuation of the converted property as a 4-bed flat was improper, not least because it hadn’t been registered for council tax as a 4-bed. He further pointed out that the conversion falls foul of the Housing Act’s regulations on overcrowding and that the kitchen, bathroom and two of the newly-created bedrooms are all well below council and statutory requirements on minimum room sizes. He highlighted that the illegal conversion is also a breach of the council’s leasehold agreement, its planning regulations and its HMO & fire safety regulations. Illegal conversion at 98 Taplow shows new plasterboard walls butted up against the middle of a window pane. A Land Registry search shows that the illegally-converted 1-bed flat at 98 Taplow was bought at auction by a property company with a commercial buy-to-let mortgage, after it was reposessed from its original owner when he was declared bankrupt in 2012. The auction particulars describe 98 Taplow as a 4-bed flat currently being let at £402 per week. Around 330 leaseholders will have to leave their homes during the Aylesbury’s 20-year redevelopment. The mere fact that the Aylesbury is being knocked down is depressing values on the estate and Southwark shouldn’t be using them as a point of comparison for determining market value for compensation. It should also stop using properties that have been illegally converted to maximise rental income, otherwise this could be seen as endorsement and there could be a rush to B&Q to stock up on plasterboard. Mr Joshua has taken a big risk with his case. Not only will he lose the legal costs he has incurred in mounting the case, but he will also have to pay those of the council should he lose. We sincerely hope that he wins and that remaining leaseholders are not put through the legal torment that he has had to suffer; they should be offered a fair price for their homes, in what is after all a scheme that was intended to benefit residents - not impoverish and displace them. The decision notice for Mr Joshua’s case is due to be issued in 3-4 months and a second Aylesbury case is due to be heard on 27th May (ref: 28 Wolverton ACQ/100/13).